Nintendo of Europe have announced the latest content to be made available through the Nintendo DSi Shop and Nintendo eShop. AERO PORTER is an airport simulation and puzzle game that will have you sorting luggage, expanding your airport’s operations and avoiding security mishaps. As your airport gains passengers and prestige, you’ll be faced with more planes to load and more luggage to colour code. And that’s to say nothing of all the special requests and suspicious packages you’ll have to deal with. You can even exchange aircraft with your friends via StreetPass as you put your airport on the map and help it grow from a few sleepy regional terminals to a bustling international hub. 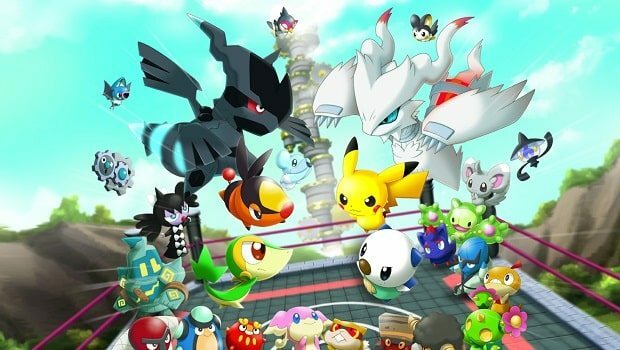 Super Pokémon Rumble allows you to battle against waves of opposing wind-up Toy Pokémon, and connect with a friend to battle together. With over 600 Toy Pokémon to collect, including those from the Pokémon Black Version and Pokémon White Version games, it’s going to be a Super Pokémon™ Rumble. A bestseller in Japan and widely acclaimed in the US, Denpa Men is a fun, new Dungeon RPG involving mysterious creatures that float around radio waves in your daily environment. Catch the Denpa Men to form a party, but bear in mind – each radio wave territory has its own unique Denpa Men so if you want to find Denpa Men with different skills, you’ll need to go to a different place in real life. Take your Denpa Men on a variety of adventures and save your loved one from the King of Evil. In Nintendo presents: New Style Boutique you take on the role of a shop assistant. Give customers advice and put a look together for them to work your way up and eventually own your own boutique. There are thousands of items and accessories to choose from, and you can also get judged on the looks you put together, great for anybody wanting to unleash their inner fashionista. Reach the top of the style stakes and take the fashion world by storm. Finally, a chance to drive as fast as you can with no regard for the law. Put the pedal to the metal and collect all the coins on each stage as quickly as possible. Execute evasive moves and collect essential items to help you dodge the police and escape being caught. Be careful though, get caught by the police three times and it’s game over. Perform last minute lane changes, stealthy u-turns and determine the rate of speed, but keep in mind, once you start going there is no stopping. DotMan is a non-stop action game that takes you back to the golden years of arcade gaming.